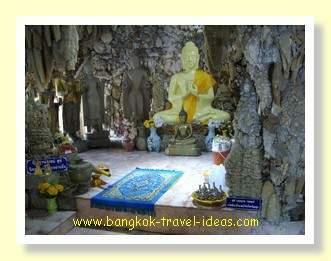 There are a few Korat Buddhist temples near the centre of town that are worth visiting. Originally the plan was to visit the nearby Phimai historical park, but there was a bit of resistance from the better half, so rather than put up a fight we took the songtaew into the town again and looked for a museum on Mattraphap road. The museum was shown on the fabulous tourist map and within walking distance of a couple of nearby Buddhist temples. We walked up and down the road, past the city gates but could not find the museum anywhere. We had a wander around the IT Mall and looked for something to eat in there, but strangely they did not have any food stalls at all. I would say that it is fairly unusual to have a mall nowadays without a food court, but there you have it. If you want to eat then don’t bother going into the IT Mall which on the map is marked as Hardwarehouse. 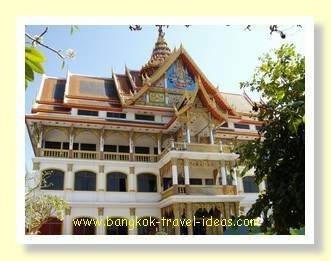 As we could not find the museum we went into the grounds of Wat Prok, which was the first of the Korat Buddhist temples on our list,. We spent some time looking around before heading back to the centre of Korat for some lunch (or was it breakfast). 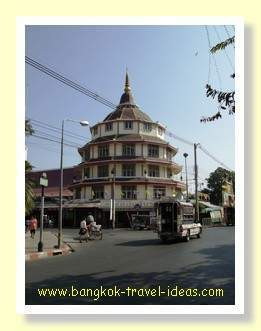 The centre of Korat has some really nice buildings and a large Buddhist temple that sits just near to the moat had caught our eye and we planned on visiting later on. Off the large square near to some civic buildings we found a market to look around. They had all sorts of interesting things on sale. 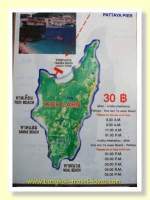 As they don't get many foreign tourists here it is all geared towards the locals. One stall was set up making roast chestnuts. He had a big heating pan with a electric motor turning the hot rocks to keep the chestnuts from burning. We bought a box of roast chestnuts of him and started to eat them. They were really delicious. 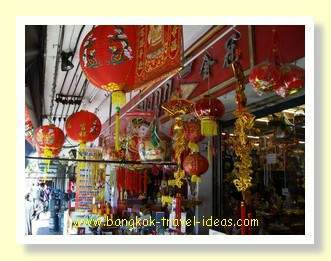 This market was all being expanded ready for the New Years Eve party and many extra stalls were being set up. As we walked through the market we came across a small shop selling raw crabs and food from the South and even though we had just eaten we had to stop and eat again. Usually I cannot stand the smell of this type of food so I went to wander around the market a little more on my own, with a promise to be back in 30 minutes. Thai markets are great to wander around as they are a mixture of people eating, sleeping and trying to peddle their wares as well as the aroma of Thai cooking. The market was fairly quiet and looked like it was really going to come into its own in the evening. I walked around looking for some interesting photo shots and then returned to the restaurant and selected an ice cream from the fridge and just sat and waited. Heading back to Mattraphap road we passed a row of Chinese shops all decked out in fancy trimmings. Some of the shops were selling gifts for the temples and some just seemed to be getting ready for the New Year celebrations. We took in the view of the city walls and moat and imagined what the town must have been like all those years ago when the troops came to attack the city. 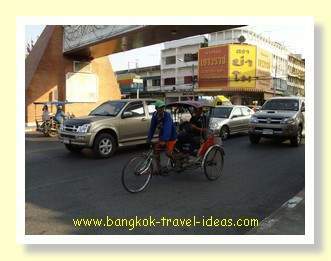 To get around Korat there are tuk tuks and the old fashioned sarmlor. Most of the guys pedalling the sarmlors looked to be in their 70's and it would be no easy task taking people around the town at this age. I hope it is something I never have to do. 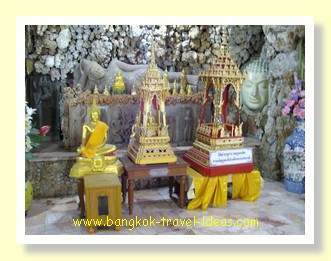 One of the Korat Buddhist temples that we wished to visit was at the corner of Chumphon Road and Pon Sean Road. You can’t miss it as it has a fabulous circular building right outside. This Buddhist temple is known as Wat Payap and the temple grounds were full of army personnel and soldiers cleaning the place up ready for the New Year. Wat Payap itself was undergoing renovations so we didn’t go in, but we found a crystal cave that was decked out with stalactites and stalagmites and Buddha images. I am fairly certain that the formations had been transplanted from somewhere else as the cave was above ground and these things normally form underground with overhead water dripping down and bringing the dissolved rock salts to create the rock formations. After spending the day walking the town and visiting a number of the Korat Buddhist Temples we took the songtaew back to the hotel and rested up. From the hotel room we had seen a night market out of the window and that was where we would go to eat in the evening. 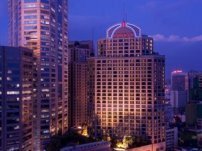 Turning left out of the Dusit Hotel we walked the couple of hundred metres to the night markets. It was frequented mostly by students from the University. There was a mix of things on sale, from second-hand clothes to sunglasses and ladies fashion. I saw the guy walking around with his elephant again on the outskirts of the market, but by the time I had found my way to the gate to take a photograph, he had gone. There were some places to eat inside the market but after about 45 minutes wandering about, browsing through the stalls for the elusive clutch bag, we headed back to the hotel. On the walk back to the Dusit Princess hotel we stopped at a little roadside restaurant to eat. I don't recall what we ate but it was freshly cooked, ready in 10 minutes and cost less than 300 Baht. 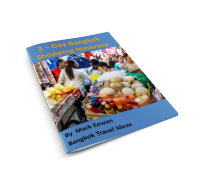 Lots of people coming to Thailand wonder how much it costs as they prepare for a backpacking or tourist trip. 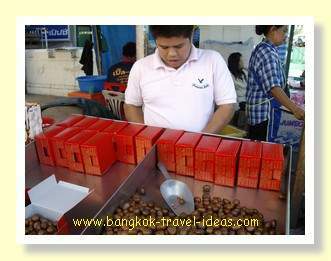 The fact is that in Thailand you can eat out quite cheaply and although I hadn't gone out of my way to save money on food we had spent less than 500 Baht on food this day, not including the roast chestnuts, of course. If you enjoyed reading about my visit to Korat Buddhist temples then you can explore more excitement in Khao Yai on Day 4 or just jump to a different day using the links below. 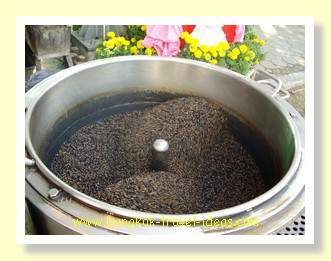 Go to Korat by car in the early morning and leave Bangkok behind. 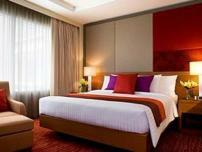 The town of Korat is located about 4 hours from Bangkok and is the gateway to the Isaan province. 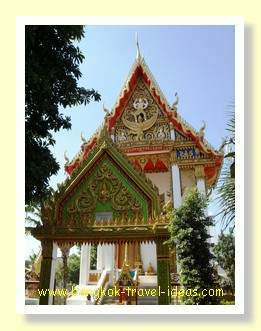 Walk around the town of Korat and discover the famous shrine to Ya Mo, who is credited with saving the township from the marauding Khmer troops.